Todds Plumbing and Heating’s engineers are fully qualified to help you install your solar heating system. A solar water heating system uses free heat from the sun to warm domestic hot water. 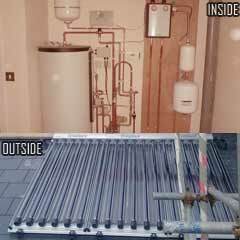 A conventional boiler or immersion heater can then be used to make the water hotter, or to provide hot water when solar energy is unavailable. Have hot water throughout the year: the system works all year round, though you’ll need to heat the water further with a boiler or immersion heater during the winter months. We will help you make the right decision in choosing the solar water heating system that is right for you and your family. We will fit solar panels, called collectors, to your roof. These collect heat from the sun and later on use it to heat up water which is stored in a hot water cylinder. A boiler or immersion heater can be used as a back up to heat the water further to reach the temperature you want. You can always be certain that you will have hot water at your disposal. We can also fit larger solar panels to provide some contribution to heating your home as well. However, the amount of heat provided is generally very small and it is not normally considered worthwhile. It does not cost much to maintain solar water heating systems. Most solar water heating systems come with a five-year or ten-year warranty and require little maintenance. Once fitted we will leave written details of any maintenance checks that we will carry out from time to time, ensuring everything is working properly. Solar water heating systems can help you save on your energy bills. Savings will of course vary from user to user. Typical savings from a well-installed and properly used system are £60 per year when replacing gas heating and £85 per year when replacing electric immersion heating. Typical carbon savings are around 230kg CO2/year when replacing gas and 500kg CO2/year when replacing electric immersion heating. It is worth noting that you may be able to receive payments for the heat you generate from a solar water heating system through the government’s Renewable Heat Incentive. You may also be able to get help with the installation costs of a new solar water heating system through the Renewable Heat Premium Payment scheme. If you are interested to know more how Todds Plumbing and Heating Ltd can help you set up your solar heating system please give us a call or alternatively you can email us for a free no obligation quote. We will be happy to talk it through with you. Todds plumbing and heating limited are solar accredited installers and fully qualified and experienced in the installation of solar heating in Hampshire.